**THIS ITEM IS CURRENTLY ON BACKORDER. 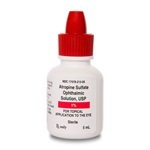 ** Sterile, mydriatic Atropine Sulfate 1% solution in 15ml dropper bottle. Manufactured by Akorn. NDC: 17478-215-15. Comes as singles. **THIS ITEM IS CURRENTLY ON BACKORDER. 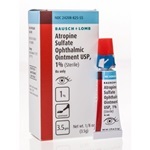 ** Sterile, mydriatic Atropine Sulfate 1% solution in 2ml dropper bottle. Manufactured by Akorn. NDC: 17478-0215-02. Comes as singles. **THIS ITEM IS CURRENTLY ON BACKORDER. 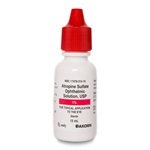 ** Sterile, mydriatic Atropine Sulfate 1% solution in 5ml dropper bottle. Manufactured by Akorn. NDC: 17478-215-05. Comes as singles. **THIS ITEM IS CURRENTLY ON BACKORDER. 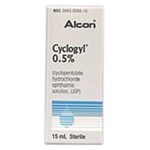 ** Sterile Cyclogyl 0.5% drops in 15mL dropper bottle. Mydriatic. generic drug name is Cyclopentolate. Manufactured by Alcon. NDC: 00065-0395-15. Comes as singles. **THIS ITEM IS CURRENTLY ON BACKORDER. 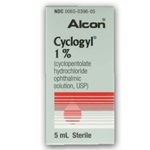 ** Sterile Cyclogyl 1% drops in 5mL dropper bottle. Mydriatic. Generic drug name is Cyclopentolate. Manufactured by Alcon. NDC: 00065-0396-05. Comes as singles. **THIS ITEM IS CURRENTLY ON BACKORDER. 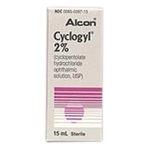 ** Sterile Cyclogyl 2% drops in 15mL dropper bottle. Mydriatic. 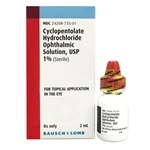 generic drug name is Cyclopentolate. Manufactured by Alcon. NDC: 00065-0397-15. Comes as singles. 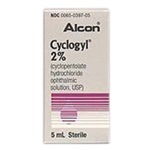 Sterile Cyclogyl 2% drops in 2mL dropper bottle. Mydriatic. generic drug name is Cyclopentolate. Manufactured by Alcon. NDC: 00065-0397-02. Comes as singles. **THIS ITEM IS CURRENTLY ON BACKORDER. 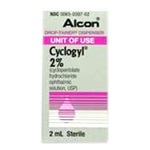 ** Sterile Cyclogyl 2% drops in 5mL dropper bottle. Mydriatic. generic drug name is Cyclopentolate. Manufactured by Alcon. NDC: 00065-0397-05. Comes as singles. **THIS ITEM IS CURRENTLY ON BACKORDER. ** Sterile Cyclomydril 1%-0.2% drops in 2mL dropper bottle. Mydriatic. 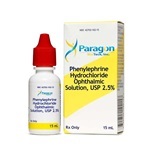 Generic drug name is Cyclopentolate/Phenylephrine HCl. Manufactured by Alcon. NDC: 00065-0359-02. Comes as singles. **THIS ITEM IS CURRENTLY ON BACKORDER. 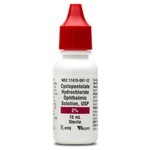 ** Sterile Cyclomydril 1%-0.2% drops in 5mL dropper bottle. Vasoconstrictor. 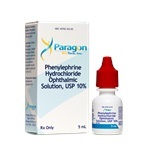 Generic drug name is Phenylephrine/Cyclopent HCl. 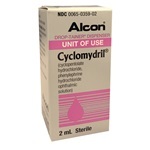 Manufactured by Alcon. NDC: 00065-0397-02. Comes as singles. 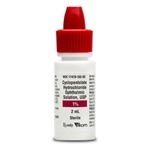 Cyclopentolate HCl 1% ophthalmic drops 15 mL. Manufactured by Bausch & Lomb . NDC Number: 24208-0735-06 . 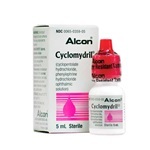 Generic drug name is Cyclopentolate HCl. Store drug at USP controlled room temperature. 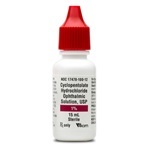 Cyclopentolate HCl 1% ophthalmic drops 2 mL. Manufactured by Bausch & Lomb . NDC Number: 24208-0735-01. 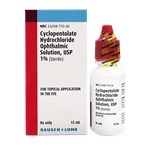 Generic drug name is Cyclopentolate HCl. Store drug at USP controlled room temperature. 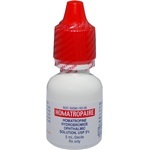 Sterile Hamatropine Hydrobromide 5% drops in 5mL dropper bottle. Manufactured by Altaire. NDC: 59390-192-05. Comes as singles. **THIS ITEM IS CURRENTLY ON BACKORDER. 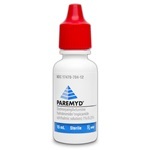 ** Sterile, Mydriatic Paremyd 1% - 0.25% ophthalmic drops in a 15 mL dropper bottle. Generic drug name is hydroxyamphetamine hydrobromide and tropicamide. Manufactured by Akorn. NDC Number: 17478-0704-12. Comes as singles.